We are staying in the Abingworth Hall, a hotel run by Holiday Fellowship. Although there has been a house on the site since the 13th century, it was destroyed by fire early in the 20th century. The present house dates from 1910, and it was converted to a hotel after the war. There are several public rooms for relaxation, and the main lounge has collections of books and board games. 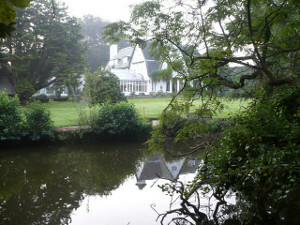 There are 8 acres of grounds, which include gardens, a lake, a putting green, a croquet lawn and a heated swimming pool. We can recommend a walk up to the top of the garden from which the views are surprisingly extensive. We have booked on a half-board basis. Breakfast will be at 0800 and dinner at 1900 each day. There is some choice of menu for dinner, but if you have an allergy, please let Linda know in good time so that your needs can be catered for. On Saturday and Sunday we will be supplied with packed lunches. As we will not be the only guests at Abingworth, HF may organise evening events, such as a quiz. One of our members may also organise something.